In more than three decades of rich experience in working with poor and marginalised communities, ASSIST has formulated a development process that aims to break the cycle of poverty by focusing on three main components: socio-educational, infrastructural and economic development. Comprehensive Community Development (CCD) is a wide-ranging set of development activities we take up within a small area over a period of at least five years. In general, we use the first six months for intensive awareness generation, mobilisation and community-based group formation. Only then, we focus on the execution and monitoring of the development activities with the participation of all community members. Addressing the core causes of poverty in a systematic and comprehensive manner has proven to be a highly effective approach in resolving rural poverty in a sustainable way. And – just as important – by giving people the tools to become masters of their own destinies, this development approach allows them to regain their pride and dignity. Find out how ASSIST has been working towards Comprehensive Community Development in two villages. Kukkalavaripalem is a coastal village consisting of 148 families located at the eastern end of Prakasam District adjacent to Bay of Bengal. Eighty-three families owned small pieces of land, though they could barely cultivate one crop a year, due to water scarcity. The landless depended on menial jobs, which are few and far away. Nearly all families were living in small huts, and a small open well was the only source of drinking water and domestic water for the entire community. Educational facilities were so poor that children either had to go elsewhere to attend school, or – more often the case – discontinued their studies altogether. In general, we found a completely neglected village, without minimal infrastructural facilities and basic amenities, so we decided to take up a comprehensive community development initiative. 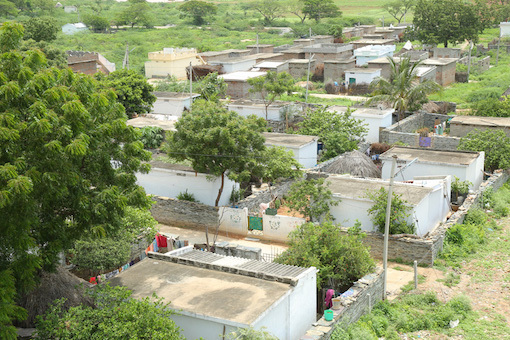 Nowadays all people in Kukkalavaripalem live in concrete houses with basic amenities and proper sanitation. Sufficient (safe) water is available for all villagers and the livelihood and health of all families have improved considerably. Last, but not least, all children are now going to school. Check out the video we made in 2010 when we had just started our development project in Kukkalavaripalem. Elachetladibba is an island community located near the Bay of Bengal. The village has 330 families, who are mostly involved in fishing or agriculture. Before ASSIST’s entry into the area, this island was suffering from low levels of child education, lack of roads and proper drainage, poor health and hygiene, and inadequate access to safe drinking water (the communities are surrounded by brackish water). To make matters worse, frequent disasters such as cyclones were perpetually flooding the community, destroying livelihoods and washing away the tiny huts in which most families lived. Three years later, Elachetladibba has made astonishing strides. Through the active participation of the community’s Village Development Society, there has been major progress in all areas. Impressed by what we had achieved together, the Government stepped in with additional support for housing, roads and the construction of a new ferry system that would ensure that the people of Elachetladibba no longer live in isolation. India - Kukkalavaripalem 2010 from Tetteroo Media on Vimeo.